The SUBWAY Helping Hearts™ Family 5K series is bouncing back to Ormeau Park for 2016! With lots of free and fun entertainment including face-painting, games and a bouncy castle, it’s the perfect day out for the whole family to enjoy! Join us for this fantastic 5k/10k run on Sunday 28th February, starting at 11am. You can run, jog or walk the route – Resolution Runs are for everyone! If your New Year’s Resolution is to get more fit and active in 2016 then this is the event for you. 6 500 runners, great atmosphere with many spectators. One of the biggest participation events in Northern Ireland. Starts and finishes Lagan Valley LeisurePlex in Lisburn City . Inspired by the colourful full moon parties held in Thailand, Glow is a night-time fun run with a difference. 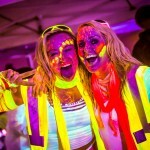 You’ll run, walk or dance the 3km route, sprayed with glow water and lit up by an Ultraviolet (UV) blacklight as you go! The SUBWAY Helping Hearts™ Family 5K series is back for 2015! With lots of free and fun entertainment including face-painting, games and a bouncy castle, it’s the perfect day out for the whole family to enjoy! Join us for this challenging 5 or 10K in Belfast on Sunday 1 March. Starting at Queen’s Sport, Upper Malone, the 5K lap drops to the Lagan through Barnett Demesne and follows the stunning Lagan towpath before a challenging climb past Mary Peters track. The 2014 SUBWAY Helping Hearts™ Family 5K Series is open to all ages and abilities. Whether you choose to run, walk or even push the buggy around the course we’d love it if you could get involved and help us raise money for Heart Research UK along the way. Multi terrain race set within picturesque private grounds. All money generated from the race will go towards people living in the slums of Nairobi Kenya. Weekly Free 5km Timed Run in the natural setting of Ecos park, Ballymena. Waterworks parkrun is a free 5K event suitable for all abilities held every Saturday at 9.30am.